May 27, 2008 — The phone call from my roommate came at the end of the day. Amy: When are you going to be home? Me: I’m on the road even as we speak. Why? Amy (laughing): I have to show you something…. When I got back to the apartment, she was sitting against the headboard of her bed, reading a book. She invited me to come in and sit where she was, to get her vantage point. You may already know that dogs are not allowed in Amy’s bedroom. You may also have read here that Truman has grown into a well-mannered dog, trustworthy around the house. 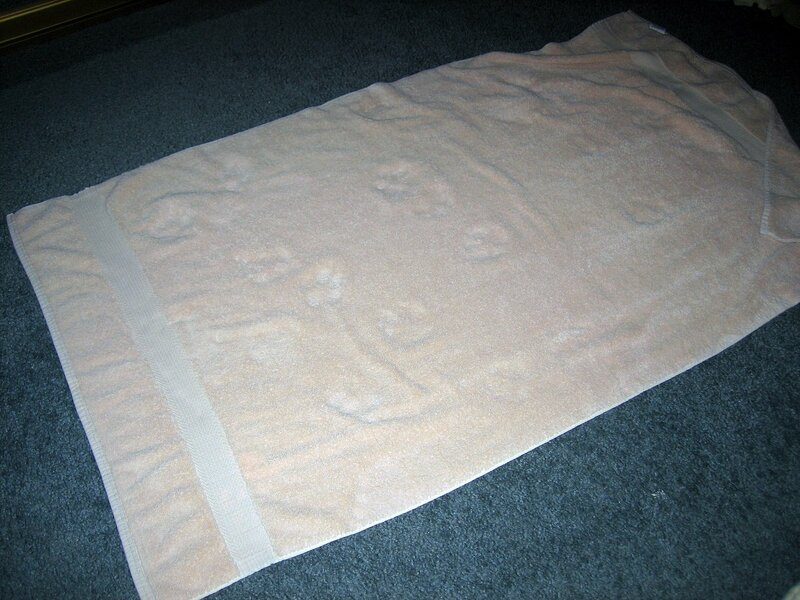 You may not know that my roommate often puts a bath towel on her floor on which she sets “lay flat to dry” clothing. Click to enlarge the evidence. I went over the events of the day in my head, and realized he would have had exactly one window of opportunity in which to perpetrate this act of sneakitude: while I was in the bathroom that evening, for approximately three minutes. Stealth Dog strikes again…but he is apparently not smart enough to cover his tracks. I would demand a DNA test be done! I just had Jury Duty and I can tell you until all the evidence is in no one knows for sure who committed the crime. HAHAHA! What a goofy puppy.